Background: In contemporary Islamic world, the mystic dimension of Islam was largely misinterpreted both by the followers & opponents. Core values of mystic Islam lies in Ihsan (favors, helping others),Ikhlas (Sincerity/purification), & adherence to the human values that stood above all the rituals, practices & institutions created in mystic world of Islam during last twelve centuries. From early figures such Owais Al Qarni up to the founding figures of Qadriya, Chishtia & Suharwadi orders down the centuries, they ruled the hearts of the masses inhabited in vast dominion of the Almighty God. It was due to high level of Ikhlas & Ihsan that was embedded as an innate trait in their souls. All these virtues were passed from one generation to other through the golden chain of spiritual successors like a beads in a string connecting them finally with Prophet ( Peace be Upon Him). During the eight & ninth centuries, the far off central Asian territories lying beyond the river Oxus up to the North African Berber provinces, the foot prints of mystic Dervishes can be found everywhere in vast dominion of Abbasid empire & also in remote Iberian peninsula ruled by Ummayads. It was from Trans-Oxonian branch of Prophet (Peace be Upon Him) family members, the blessed ancestors of Nizamuddin were born at Bukhara. Nizamuddin is the fourth generation successor of Chishti Tariqa (Path) in Indian Subcontinent. The benevolent Nizamuddin made traits of Ihasan & Ikhlas as a part & parcel of his life that gave him a title of “Mehboob Ilahi/beloved of God“. 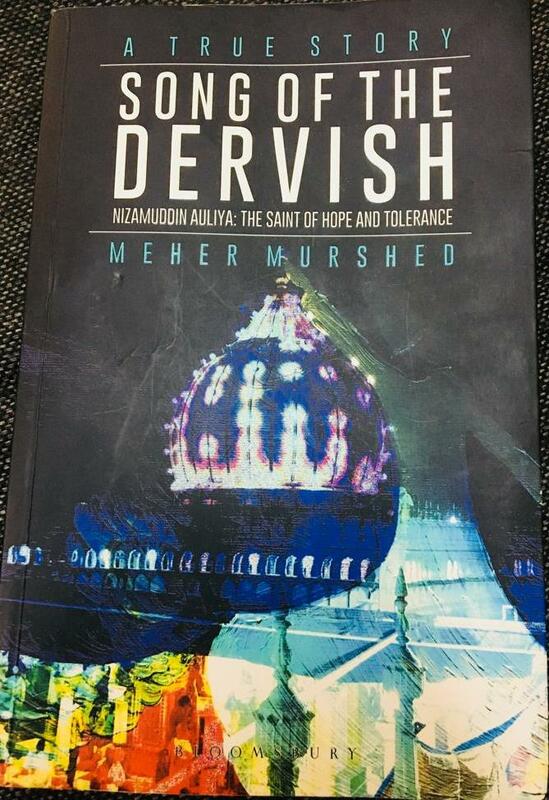 Book review: The “Song of Dervish: Nizamuddin Auliya, the saint of hope and tolerance” is a book authored by Meher Murshed & published by Bloomsbury, India in 2017. A preface is written by Dr. Bruce Lawrence, a professor of Islamic Studies, & scholar on Sufism who had translated a worthy account of Nizamuddin from Persian in English. His account gave vivid portrait of Mehboob Ilahi by connecting real stories of twentieth century centered around the living saint with the historical accounts of thirteenth & fourteenth centuries. The book started with a contemporary narratives of Nizamuddin followers who love & revere the saint as he was followed by his disciples during his life time. Sanjiv Malhotra, Kamwal Nain Sharma, Bauji ( Om Prakash Arora) & Dr Bruce Lawrence belonged to different faiths, background & enthicities. An explorative accounts of Murshed draws one common trait in all these human souls, the love & faith in Mehboob Ilahi. “Devote your life to God, serve the poor & the needy to realize the Maker” the life long learning of Nizamuddin from his master Baba Farid. Murshed’s account draws two contrast pictures from fourteenth century Delhi. At one end, the Palaces of Sultans showered extravagance on skank nobles who lauded the temperamental monarchs for their vices & virtues. On the other hand, the humble court of Nizamuddin at Ghyaspur offered robes to the disciples who offered food, love, service & devotion to the poor souls of Maker. The integration of Nizamuddin biography with the contemporary accounts of his lover assimilates the belief “The saint never die”. The book presents an alluring amalgamate of the rare accounts on the predecessors & immediate successors of Nizamuddin. The stories from the life of the early jewels of Chishti order were revisited. How the prayers of Nizamuddin & sugar from his bowl made his beloved disciple Khusro, a celebrated poet. Murshed’s account sketched the bipolar world of Khusro & his friend Amir Hasan Sijzi. Both of them finally submerged their souls in love of divine leaving behind rubies, & Gold. They find solace with Nizamuddin instead of worldly gifts from treasures of maniac sultans. The Dervish took the message of Prophet (Peace be Upon him): Divine mercy is for one & all. Lyons, Lawrence, Gita, & Rahman finds a common bond between them, the love for Nizamuddin. At the point of time when hatred & intolerance is on its height, the “Song Of Dervish” iterate the stories of love & compassion centered around Nizamuddin, a saint whose blessings crossed the lines of caste, creed, gender & religion. Poetic translations, simple language, citations of “Fawaid Al Fuad” & extensive research on real life narratives spoke of its rigour. The enchants of “Man Kunto Muala‘ that echoed on the ears of Murshed during childhood days became a prime stimuli to start a journey of “Song of Dervish“. A distinctive account on Nizamuddin, it will be a soul enriching experience for the readers who carried an interest in Mystical Islam & medieval history of Delhi. I would like to thanks Meher Murshed who blessed the lovers of Nizamuddin & motivated readers by offering “Song of Dervish“.